The Grand Avenue, America's Main Street, a National Embarrassment—Pennsylvania Avenue has been known by these names and more since it was laid out across farmland in the 1790s. From the beginning, the one-mile stretch between the Capitol building and the White House was intended to be a symbolic link between the key branches of government, but over more than two centuries, it has witnessed grandeur and squalor, national pride and neglect, and crowds full of celebration and rage. While the pillars of government at either end have stood watch, the avenue has seen buildings, institutions, and neighborhoods rise, prosper, decay, and fall. A grand marketplace, a major train station, dozens of hotels and restaurants—all thrived, yet only a handful remain. Once a teeming city thoroughfare, then a bland, nearly lifeless area dominated by hulking federal buildings, the avenue today is regaining some of the vitality that marked its earlier years even as it remains one of the nation's best-known streets. 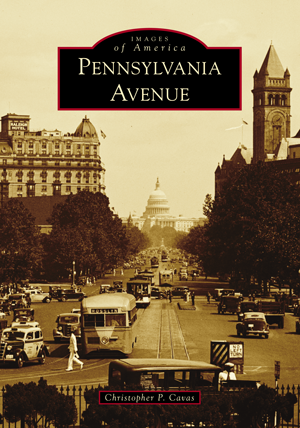 Making use of thousands of rarely seen images largely drawn from the collections of the Library of Congress and the National Archives, Washington, DC, native Christopher P. Cavas surveys the always-changing cityscape as the avenue developed over the decades. Of particular interest is the use of aerial imagery, which gives a strong sense of the avenue’s place in the city that surrounds it.